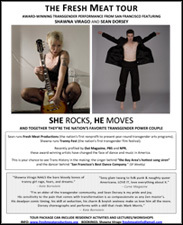 AWARD-WINNING TRANSGENDER PERFORMANCE FROM SAN FRANCISCO FEATURINGSHAWNA VIRAGO AND SEAN DORSEY SHE ROCKS, HE MOVESBRING TWO AWARD-WINNING TRANSGENDER PERFORMANCE PIONEERS TO YOUR CITY! The Fresh Meat Tour is an explosion of transgender politics, performance and dance: it’s a full-length performance featuring solo work by award-winning choreographer Sean Dorsey and trailblazing folk-punk musician Shawna Virago. Book this Tour now for your college, university, school or theater! Contact freshmeatinfo@gmail.com for rates and details. Sean and Shawna have been profiled in Out Magazine, Curve Magazine, PBS and NPR – and have played to sold-out audiences from New York to Los Angeles. They’ve collaborated with artists including Kate Bornstein, Lana and Andy Wachowski (directors, The Matrix) and Antony and the Johnsons. Sean and Shawna have facilitated hundreds of LGBT workshops, trainings and regularly host panel discussions and Q&A’s pre-or-post-show, so there are lots opportunities for audience and/or student participation at your college or theater! Sean runs Fresh Meat Productions (the nation’s first nonprofit to present year-round transgender arts programs). Shawna runs San Francisco Transgender Film Festival (the nation’s first transgender film festival). these award-winning artists have changed the face of dance and music in America. “I’m an elder of the transgender community, and Sean Dorsey is my pride and joy. His sensitivity to the pain that comes with transformation is as compassionate as any Zen master’s. His deadpan comic timing, his skill at seduction, his charm & boyish sexiness make us love him all the more.